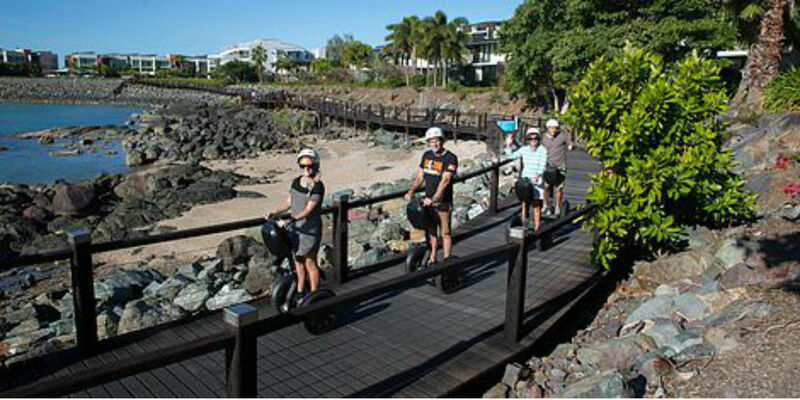 Two Amazing Airlie Beach Australia Guided Segway Tours. Segway tours operate amazing guided Segway tours in the Whitsunday Conway National Park and along the Airlie Beach boardwalk with tapas over sunset. Segway Rainforest Discovery Tour Ride your own Segway through the spectacular Conway National Park rainforest, along the Whitsunday Great Walk. Surrounded by lush rainforest and flowing streams, our experienced tour guide will share interpretive commentary, highlighting the local flora and fauna and points of interest during the 9km round journey. Segway Sunset and Tapas Boardwalk Tour Ride your own Segway along the Whitsunday Bicentennial Boardwalk overlooking the pristine waters of Pioneer Bay. The tour begins in Airlie Beach and glides on the boardwalk along the water’s edge past Abell Point Marina, Shingley Beach and the Whitsunday Botanic Gardens, through to Cannonvale Beach. Your experienced tour guide will provide informative commentary and highlight points of interest along the 7km round journey. Feel the breeze in your hair on the return trip, gliding effortlessly along the boardwalk before arriving at Barcelona Tapas Bar and Cafe, where it’s time to relax and enjoy a variety of exquisite tapas while soaking up the evening sunset views. Choose to stay for dinner or continue your return Segway ride back to Airlie Beach.